지장보살과 심판관인 시왕을 그린 지장시왕도이다. 지장보살은 지옥의 고통에서 허덕이는 중생들을 극락세계로 인도하는 보살로, 지장을 그린 그림에는 지옥을 지키는 호법신이나 심판관의 모습이 함께 등장한다. 이 그림의 화면 중앙에 본존인 지장보살을 크게 그리고 아래쪽 좌우에 작게 시왕, 사천왕, 도명존자 등을 배치하여 섬세한 필법으로 묘사하였다. 이러한 구도는 지장신앙과 시왕신앙이 결합되었지만 지장이 주가 되고 시왕이 종속적 의미를 지녔음을 그림으로 나타낸 것이라 볼 수 있다. 이 지장시왕도는 오늘날 전해지는 10점의 고려 불화 가운데 하나로 14세기 경에 그려진 것으로 추정되며, 고려 불화연구에 귀중한 자료이다. Ksitigarbha Bodhisattva is believed to lead people in profound pain from the entrance of hell to heaven. Thus, the god protecting hell and the judge of hell often appear on the paintings of Ksitigarbha Bodhisattva. At the center of this painting, the Bodhisattva is depicted very largely; arranged on the right and left under the Bodhisattva are the Ten Underworld Kings, Four Guardian Kings, and Buddhist saints. 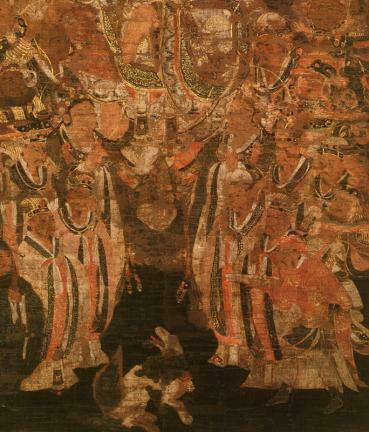 This painting clearly shows that Ksitigarbha Bodhisattva was the main feature of the belief on Ksitigarbha Bodhisattva and the Ten Underworld Kings. 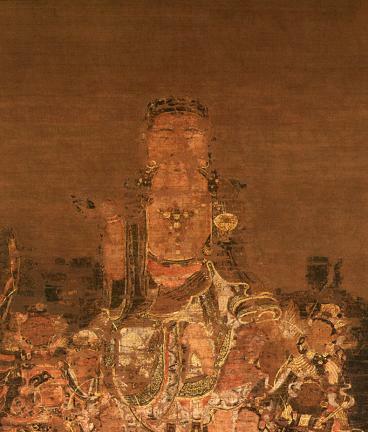 As one of the ten remaining Buddhist paintings made in the Goryeo Period, it is presumed to have been painted in the 14th century. It provides valuable information on the Buddhist paintings of the Goryeo Period.